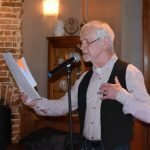 Ray is a published poet from Farnham, regularly reading at open mic poetry events in London and in the Home Counties and tends to favour characterisations using regional accents for poems of an ironic nature whilst also being fond of more serious material too. Ray currently has two pamphlets to his credit, and Dempsey & Windle have published two collections by Ray who has at various times in a varied life been a musician working on the BBC and on cruise ships, a skilled furniture restorer, a bird – watcher, an opportunistic photographer, and a keen railway enthusiast. 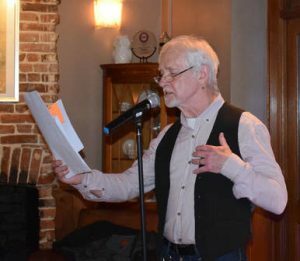 He is a collector of quaint words, dialects, regional accents, other people’s conversations, tin whistles, and other shiny things, which may go some way to explain the eclectic nature of his poems. His stories, dryly and sometimes absurdly humorous, are always entertaining and sometimes moving.